Wireless networking has become one of the fastest growing trends in the home computer market. The latest complete standard, 802.11n (or “wireless-N”), is capable of speeds faster than many wired networks and has better range and reliability than its predecessors. However, a replacement standard called 802.11ac (or “wireless-AC”) is already on the drawing board and some manufacturers have even released products using the incomplete standard. 802.11ac, expected to have final approval in 2013, improves upon many of the new technologies that debuted in the 802.11n standard. 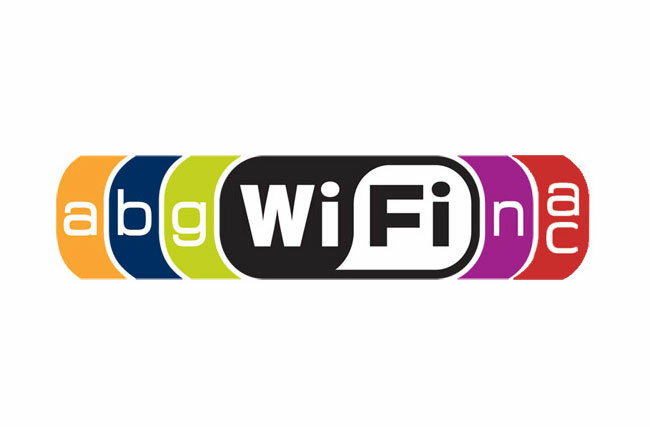 Wireless-N typically connects at speeds up to 150Mbps, with some higher end devices capable of an impressive 300Mbps or even 450Mbps. However, wireless-AC promises to triple those speeds so the lower end devices using wireless-AC will be as fast as the highest-end devices using the current 802.11n standard and the higher end devices will be able to outperform today’s fastest wired connections. While wireless-N is already fast enough for most current network needs, including streaming HD video, the 802.11ac standard promises to allow even higher quality media to be streamed to multiple devices at the same time. In addition to huge speed increases, the new standard also promises better range and reliability. 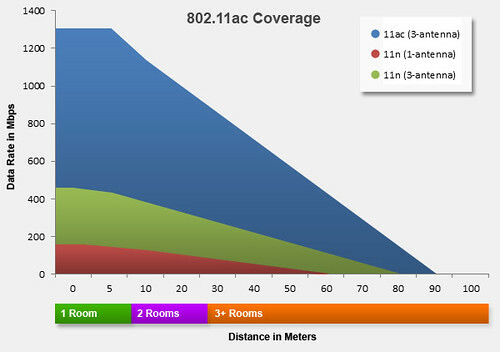 Although the overall technology behind it is complex, there are two features of 802.11ac that make the biggest difference. Firstly, wireless-AC will use the 5GHz wireless spectrum, which helps to avoid interference with wireless phones and many other devices (including older wireless-G and wireless-B networks) that use the 2.4GHz frequency. Fiber optics is a type of transmission line or cable is made of glass or plastic is very smooth and smaller than a hair, and can be used to transmit light signals from one place to another. The light source used is usually a laser or LED. This cable is approximately 120 micrometers in diameter. Light that is in the optical fiber does not come out because the refractive index of glass is greater than the refractive index of air, because the laser has a very narrow spectrum. Speed ​​optical fiber transmission is very high so it is great to use as a communication channel. The efficiency of the optical fiber is determined by the purity of the building blocks of glass / glass. The more pure glass material, the less light is absorbed by the fiber optics. 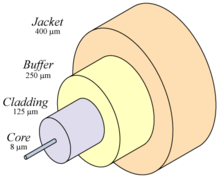 Broadly speaking, the structure of the optical fiber is divided into two parts, namely core and cladding (wrapping of the core). Caldiing have a function to protect the light that bounces off the core leads out to be reflected back into the core. Cladding can reflects the light from the core that leads out because the cladding have a lower refractive index. 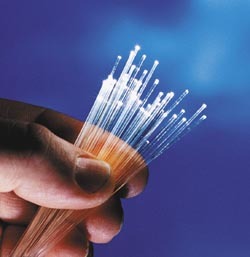 In fact the optical fiber is also wrapped in a layer called resin-called jacket. This resin layer can absorb the light so as to prevent leakage that leads out of the core. Broadly speaking, the distribution of types of optical fibers can be seen from two aspects, namely based on the propagated mode and based on the core refractive index. Google’s secure data centers are some of the most energy efficient in the world. Each year we save millions of dollars on energy costs, and we use renewable energy whenever we can. Cloud computing is the delivery of computing and storage capacity as a service to a community of end-recipients. The name comes from the use of a cloud-shaped symbol as an abstraction for the complex infrastructure it contains in system diagrams. Cloud computing entrusts services with a user’s data, software and computation over a network. Using Software as a Service, users also rent application software and databases. The cloud providers manage the infrastructure and platforms on which the applications run. Cloud computing relies on sharing of resources to achieve coherence and economies of scale similar to a utility (like the electricity grid) over a network (typically the Internet).At the foundation of cloud computing is the broader concept of converged infrastructure and shared services. JAKARTA – Hitachi storage technology provider Data Systems announced the integration between the two main solutions with VMware vSphere 5 and their latest set of cloud infrastructure for optimization and development of IT infrastructure and accelerate the deployment of cloud computing. Both of these solutions is the Hitachi Virtual Storage Platform (VSP) and the Hitachi Adaptable Modular Storage (AMS) 2000. In addition, Hitachi VSP will extend the benefits of the features in VMware vSphere 5 to the external array storage system from a third party. The role of storage in virtualized server environments become increasingly important as more and more virtual application with an increasingly large scale deployment. VSP Hitachi and the Hitachi AMS became a fully integrated foundation in developing the VMware environment so that customers get the level of flexibility and scalability that is unmatched. “Hitachi Data Systems and VMware share a common vision, namely that virtualization technology is the basis for realizing Cloud computing and cloud infrastructure,” said Hu Yoshida, Chief Technology Officer, Hitachi Data Systems, as reported through the official statement on Wednesday (27 / 7 / 2011). Time Travel It’s Impossible to Do! HONG KONG – Hong Kong The physicists succeeded in proving that the photon (light units) single follow Einstein’s theory which says that nothing can be faster than the speed of light, in other words, time travel is impossible. The team of researchers from Hong Kong University of Science and Technology led by Professor Du Shengwang say they have proved that a single photon ‘follow the laws of the universe’. Similarly, as quoted by Discovery News, Wednesday (27/07/2011). “Einstein’s claim that the speed of light is at the core laws of the universe, or simply, nothing can surpass be faster than light,” wrote the university on his official website. “Research Professor Du demonstrate that a single photon, also follow the laws of the universe as electromagnetic waves (EM),” he added. The possibility of time travel attracted approximately 10 years ago after scientists discovered that the development of optical pulses on certain media capable of faster than light, which later proved to be only a mere visual effect. Even so, scientists remain convinced that it is still possible for a single photon to exceed the speed of light. Du believe that Einstein was right and this discovery could establish a long debate in advance about the possibility of time travel. “In addition, this study also expected to give an overview to the scientists regarding the transmission of quantum information,” added Du. Samsung launched several essential accessories with the Samsung Galaxy Tab 10.1 Android Honeycomb tablet, and the Full Size Keyboard Dock functions as both a keyboard and a media dock. If you only need a multi-media dock, check out our review of the Samsung Galaxy Tab 10.1 Multi-Media Dock. The Full Size Keyboard Dock for the Galaxy Tab 10.1 has a built-in cradle that makes it very convenient to dock the large tablet in the best angle to use with the keyboard. The keyboard dock has a standard US keyboard layout, plus a dedicated row of Android specific keys and multimedia playback keys. And like the Multi-Media Dock from Samsung, the Full Size Keyboard Dock comes with a 3.5mm audio out jack and a pass-through data sync port. The Samsung Galaxy Tab 10.1 Full Size Keyboard Dock is reasonably slim but heavier than many portable tablet keyboards we’ve seen, such as the HP TouchPad Wireless Keyboard or the Motorola Wireless Keyboard for the Xoom. But these keyboards don’t come with a cradle to hold the tablet, so they can afford to be light and ultra-thin. The Samsung Galaxy Tab 10.1 Full Size Keyboard Dock weighs 1 lb and 5.4 oz., and the tablet is steady when it’s sitting in the keyboard’s cradle. The Samsung keyboard actually has a less tilted angle than the HP TouchPad’s keyboard. The keys on the Samsung keyboard have matted surface that feel soft and not slippery when typing on them. Along with a notebook size chiclet keyboard, the Samsung Galaxy Tab 10.1 Full Size Keyboard Dock also has a data sync port and an audio out which come in very handy if you are using the keyboard also as a multimedia playback dock. You can hook up stereo speakers via the keyboard for music and movie playback. You can also sync your tablet while it’s in the keyboard dock, and charge the Galaxy Tab 10.1 via AC (not via PC) while it’s in the keyboard dock as well. They Samsung Galaxy Tab 10.1 Full Size Keyboard Dock has a long rubber strip on the bottom towards the back and two rubber feet towards the front to prevent the keyboard dock from slipping on a smooth surface. The Samsung Galaxy Tab 10.1 Full Size Keyboard Dock is a bit shorter and narrower than a 13” notebook keyboard, but keys have good space and size that you won’t feel cramped when you are typing on this keyboard. While the keyboard has nice keys, the key travel is shallow which might be the only thing to get used to when you start using this keyboard. The key locations are standard with 2X sized Backspace keys and 2X sized Shift key on the left. The right Shift key is not double sized. The Samsung Galaxy Tab 10.1 Full Size Keyboard Dock has a dedicated top row of Android keys that make sworking with the tablet a lot easier and minimizing the number of times you have to use the touchscreen. It’s very nice to have a hardware keys mapped to all standard Android Honeycomb on-screen controls including keys for Back, Home, Running Apps, Application screen, Menu, Delete, Screen on/off as well multimedia playback controls keys, sound and screen brightness control keys. And just for a good measure, Samsung throws in dedicated keys for launching the web browser, email app, search and voice search. One thing that the Samsung Galaxy Tab 10.1 Full Size Keyboard Dock performs better than the HP TouchPad Wireless Keyboard is that the four directional keys on the keyboard can control navigation in just about everything including navigating the app screen, in a web page, in a document, on a map and more. What’s even more is that when you combine the four directional keys with the Control key, they turn into Page Up/Down, Home and End keys. Nice! When the Samsung Galaxy Tab 10.1 Full Size Keyboard Dock works as designed, it’s a highly functional keyboard thanks to the dedicated Android keys. But it’s not without the first gen glitches. If you’ve read our Multi-Media Dock review, you’d know that the dock puts the tablet in a Dock screen where the Home key is disabled. The Keyboard Dock tends to do the same thing if you are not careful. When that happens, you can’t easily get to the Home screen or app screen even using the touch buttons on the tablet. The Back button and running apps button work on the tablet, so you can get back to the last app or screen you were in or any apps you have running by using the on-screen button. The nice dedicated Android hardware keys on the keyboard don’t work when the tablet is in the “Dock” screen mode. That’s bad! The only thing that seems to get you out of this is to shut down the Galaxy Tab 10.1 before you dock it in the keyboard and turn the tablet on while it’s sitting in the keyboard. Doing this, the tablet will turn on and go into Home screen normally. But be careful, if you take it out and put it back on the keyboard a few times, sooner or later the default “Dock” screen will show up, and you are locked out of the access to the Home button again! We hope that this is a glitch that Samsung will fix with a software update. The Samsung Galaxy Tab 10.1 Full Size Keyboard Dock is a great solution for those who want a multimedia dock for charging/syncing and movie watching combined with a keyboard. It comes with an extra audio out jack and pass through power and data port. The keyboard has an excellent Android keys that make controlling the tablet easy and fast. The directional keys work in most apps and screens, and can also function as Page Up/Down, Home and End keys. The keyboard has a standard layout, won’t need much time to get used to. The key’s surface feels nice, though the key travel could be better. The biggest concern we have for this keyboard is that dreaded “Dock” screen where you have no direct access to Home or App screen. It’s a wrong thing to put that as the default screen since users don’t usually buy a keyboard as a night clock stand.